iiziRun Developer is free to install from App Store and Google Play. The iiziRun Developer app is used to test UI designs developed with the iiziGo IDE. It also runs iizi universal apps from an iiziServer without having to submit your app to Google Play or the App Store more than once. 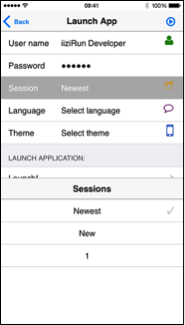 After installing iiziRun Developer on a mobile device, configure a server and choose your iiziApp. At this point in your set up, your iiziServer must be running in iiziGo. 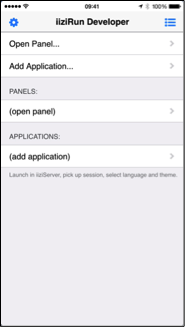 On opening iiziRun Developer you are prompted to open a Panel or add an application; tap ‘Add Application’ and continue directly to ‘Server’ and then tap ‘Add Server’. Having chosen ‘Add Server’, enter the server definition and port for your computer’s local IP or local network IP, and click the blue ‘Save’ icon at top to save. Upon tapping ‘Application’ you should find your current iiziApp available, tap it to choose it, and once added, tap the blue ‘Save’ icon at top. Repeat the above process for any phone or tablet you wish to use for development and testing. As you develop your iiziApp, you can update and view your work instantly on connected devices with iiziRun Developer. Connect as many devices as you wish for viewing and testing you Java code, Panels and components, or any other app functionality. In addition to runtime tests, you can choose any Panel from the iiziRun Developer ‘Open Panel’ section and develop with your device connected by Wi-Fi or by cable. 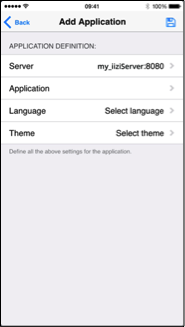 The Open Panel option in iiziRun Developer does not require running the iizi Development Server. All changes made to your Panel should update immediately on all your connected phones and tablets without needing to refresh or relaunch. This view of a single Panel displays the iiziGo’s localhost design view, and like the Design Editor, does not include UI actions, links or connections to other Panels. 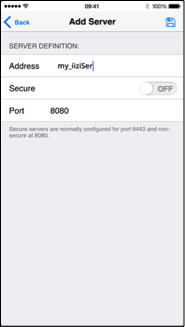 To connect a device to the iiziGo localhost instance, choose ‘Open Panel’ in iiziRun Developer and set up an iiziGo instance by tapping: iiziGo instance > add iiziGo. Here you can add your localhost address or IP.